A.R.R.R. Roberts( aka Adam Roberts) is in the English Department of Royal Holloway, one of the 8 larger colleges of the University of London. He received his MA from Aberdeen University and his PhD from Cambridge University. British science fiction author Adam Roberts has donned the reasonably transparent pseudonym A.R.R.R. Roberts for a foray into the parodical land of Upper Middle Earth. Coming on the coat tails of Peter Jackson's adaptation of The Lord of the Rings, Roberts focused his attention on J.R.R. Tolkien's earlier work, The Hobbit, providing a parody to act as a companion to the Harvard Lampoon's quintessential The Lord of the Rings parody, Bored of the Rings. 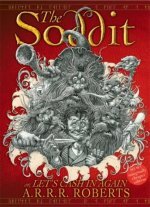 The Soddit tells the story of a lone soddit named Bingo Grabbins, hired as a thief by the wizard Gandulf and a cadre of twelve dwarfs. The dwarfs make it clear to Bingo that the purpose of the quest to the Only Mountain is to gain the dragon's gold. This clear subterfuge, of course, eventually causes problems, as the usually perceptive soddit buys the dwarfs' claim. While Roberts generally follows the plot of The Hobbit, down to the parodying of chapter titles, he also adds some new twists and turns to the tale, which raises the book above the standard parody. His view of dwarfs, wizards, and dragons is clever and intriguing, enough to base a more serious piece of fiction upon. At the same time, his explanations for some of the names in Tolkien's original work are merely fun, such as his explanation of Bard the Bowman. Tolkien, of course, provides many excesses which readily give themselves to parody. Roberts takes full advantage of these with his occasionally overblown descriptive passages, discussions of etymology of names and words, and histories of the various races his soddit and dwarfs encounter. Roberts does an excellent job of capturing the feel of Tolkien's original work while at the same time bringing his own voice to the novel. Occasionally the narrator's voice overwhelms the narrative, but in a parody of this sort, that isn't a problem. What makes it work even better is that Roberts has written an actual novel rather than an extended joke. He creates characters the reader cares about in settings which are three dimensional. When a character dies, it isn't just an offhand note, but something that has a resonance for the reader, a feature commonly lacking not only in parody, but in many works of fiction. The Soddit is not to be Roberts's only foray into the lands of Upper Middle Earth. The book did well enough that it is being followed by The Sell-a-million, a parody of Tolkien's The Sillmarillion, although as the advertising copy points out, since only about forty people have read The Sillmarillion, a direct parody of it isn't necessarily necessary. In any event, if Roberts's other parodies are as humorous and well-written as The Soddit, he will have formed a parallel career to his work as a serious science fiction author.